Wars, both civil and foreign, I undertook throughout the world, on sea and land, and when victorious I spared all citizens who sued for pardon. Imperator Gaius Julius Caesar Octavianus Augustus (23 September 63 BC – 19 August 14), born Gaius Octavius, was the adopted son of Julius Caesar and the first Roman Emperor. He also became a pontiff and later Pontifex Maximus. The Julian marriage laws (nos. 120-123, etc.). May it be my privilege to have the happiness of establishing the commonwealth on a firm and secure basis and thus enjoy the reward which I desire, but only if I may be called the author of the best possible government; and bear with me the hope when I die that the foundations which I have laid for its future government, will stand firm and stable. Suetonius, Divus Augustus, paragraph 28. I came to see a king, not a row of corpses. After having visited the mausoleum of Alexander the Great in Alexandria, Augustus was asked if he also wanted to visit the mausoleum of the Ptolemies; in Suetonius, Divus Augustus, paragraph 16. Translation: Robert Graves, 1957. Said of Publius Quinctilius Varus, who commanded the three legions lost at the Battle of the Teutoburg Forest; in Suetonius, Divus Augustus, paragraph 23. Translation: Robert Graves, 1957. Sat celeriter fieri, quidquid fiat satis bene. In Suetonius, Lives of the Twelve Caesars, II., 25. Cf. Shakespeare, Macbeth I. vii, "If it were done when 'tis done, then 'twere well it were done quickly". En Romanos, rerum dominos, gentemque togatam! Behold them, conquerors of the world, the toga-clad race of Romans! Said disparagingly of a group of men in cloaks, quoting Virgil's The Aeneid. 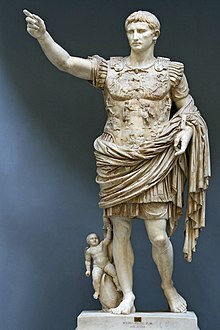 Augustus allowed only those wearing a toga and no cloak to enter the Forum; in Suetonius, Divus Augustus, paragraph 40. Translation: Robert Graves, 1957. The grain supply to the city of Rome was a contentious political issue; in Suetonius, Divus Augustus, paragraph 42. Translation: Robert Graves, 1957. My dear Tiberius, you must not give way to youthful emotion or take it to heart if anyone speaks ill of me; let us be satisfied if we can make people stop short at unkind words. Ut vides, klimaktera communem seniorum omnium tertium et sexagesimum annum evasimus. I have escaped, as you see, the common climacteric of all old men—my sixty-third year. Epistle to Caius Caesar (Aul. Gell. Noct. Att. xv. 7. ), written on 23 September A.D. 1. Αἴθ᾽ ὄφελον ἄγαμός τ᾽ ἔμεναι ἄγονός τ᾽ ἀπολέσθαι. Ah, never to have married, and childless to have died! Quoting Homer's Iliad. Augustus was frequently disappointed in the conduct of some of his children; in Suetonius, Divus Augustus, paragraph 65. Translation: Robert Graves, 1957. Goodbye, Livia; remember our marriage! Referring to the faction of Marcus Antonius. Those who slew my father I drove into exile, punishing their deed by due process of law, and afterwards when they waged war upon the republic I twice defeated them in battle. The whole of Italy﻿ swore allegiance to me. Suetonius, of Augustus and the city of Rome, in Lives of the Caesars, Divus Augustus, XXVIII, 3. He [Julius Caesar] learned that Alexander, having completed nearly all his conquests by the time he was thirty-two years old, was at an utter loss to know what he should do during the rest of his life, whereat Augustus expressed his surprise that Alexander did not regard it as a greater task to set in order the empire which he had won than to win it. Marcus Antonius, taunting Augustus for his conduct during the Sicilian war against Sextus Pompey in 36 BC; in Suetonius, Divus Augustus, paragraph 16. Translation: Robert Graves, 1957. Postquam bis classe victus naves perdidit, Aliquando ut vincat, ludit assidue aleam. He took a beating twice at sea, And threw two fleets away. So now to achieve one victory, He tosses dice all day. A popular rhyme at the time of the Sicilian war, mocking Augustus' habit of playing dice; in Suetonius, Divus Augustus, paragraph 70. Translation: Robert Graves, 1957. The story of his career shows that Augustus was indeed ruthless, cruel, and ambitious for himself. This was only in part a personal trait, for upper-class Romans were educated to compete with one another and to excel. However, he combined an overriding concern for his personal interests with a deep-seated patriotism, based on a nostalgia of Rome's antique virtues. In his capacity as princeps, selfishness and selflessness coexisted in his mind. While fighting for dominance, he paid little attention to legality or to the normal civilities of political life. He was devious, untrustworthy, and bloodthirsty. But once he had established his authority, he governed efficiently and justly, generally allowed freedom of speech, and promoted the rule of law. He was immensely hardworking and tried as hard as any democratic parliamentarian to treat his senatorial colleagues with respect and sensitivity. He suffered from no delusions of grandeur.